One of my hobbies is golf. I can’t really explain how one catches the golfing bug, but I’ve caught it. There is something about the challenge of hitting good shots over and over. It seems the best players are the most consistent. Golf is not a game of great shots. It’s a game of bad shots and how good those bad shots are. The best players in the world don’t hit great shots all the time, but they also don’t hit bad shots all the time. They find out how to raise the level of their “bad” and make sure it’s better than everyone else’s “bad”. Amateurs can hit great shots once in a while. Those are the shots that keep you coming back for more punishment. But amateurs hit a lot of bad shots and those bad shots usually result in penalty strokes, extra chips and extra putts. Anyway, I was reading through this month’s Golf Digest and noticed that it had some great article title formulas that work well for business bloggers. So this post will take you through some of the title lessons from the magazine that you can use to create intriguing articles for your business blog. Phil Mickelson is popular and intriguing. 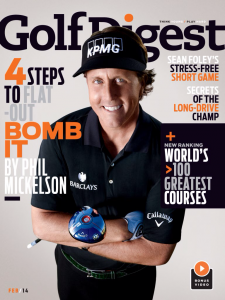 His secrets for playing good golf are interesting to a lot of amateurs and probably to pros too. This article is also about a topic that golfers love to read about – distance. When you pick a popular topic you can do really well with your readers (duh). This is also a list with 4 steps. That’s key. People like lists and they like step-by-step instruction. This is a post that GD does every year. It’s popular and people keep coming back to see the updated list. People love lists. They love rankings. Some agree with the rankings and others disagree. That leads to some good engagement with the post, which increases exposure. If you can create an annual ranking for your industry you’ll be a source of expert information. It can bring in traffic and new business. That’s a popular saying in the golf world and it’s probably become popular because there is a bit of truth to it. Golfers love hitting it long off the tee. Even if the rest of their game is not-so-good, players love hitting it far. So in this title you have the right topic – distance – and you’re also getting secrets from the person that hits it farther than anyone else in the world. If you want to hit it far you can’t help, but click on this link. Sean Foley is a big name in golf coaching. He’s become bigger in the golf world the last few years mostly for being the new coach for Tiger Woods, but Foley also has recent major winners and big time players like Justin Rose and Hunter Mahan on his roster. You’ll notice in his articles in GD that these names are all mentioned. It gives a little proof to the articles. Another key part of this title is the “stress-free” part. Golf is a very stressful game so a tip suggesting that it’s possible to play stress-free makes a reader interested. This was a fun post in the magazine. The predictions were actually just fun and entertaining instead of being more serious. There are always predictions made in nearly every industry early in the year. People do read them even if it’s difficult to predict the future. The lesson here is that predictions do well and so do lists. Doing these types of posts can do well for you and you can mix it up a little by making the predictions more fun and entertaining. Golfers are always after more distance. It’s perhaps the biggest factor in determining how good a golfer can be. If you can’t hit it far you’re going to need to become really good at the other areas of the game. Again, this title has a name drop with Rick Smith. He’s consistently ranked as one of the top teachers in the industry. Golfers recognize his name. This is also a How To post. Those have a history of doing well with readers because it gives them specific instructions on how to improve. Didn’t there used to be a best practice to keep titles less than 60 characters? This title proves that you can’t always trust best practices. There is a lot going on here and when it all comes together it works well. You have the name dropping of the hottest golfer in the world at the end of 2013. There is a number and even more important it’s a big number with dollar signs. For some reason people are always interested in money no matter what the subject is. And money is mentioned twice in the title. Keeping titles short is a good best practice, but I think people focus too much on what they think Google wants. Forget about Google and focus on your reader. If your reader likes long titles on occasion like GD’s readers do then make a few long titles. There are a lot of different formulas for creating blog titles. You also don’t have to start with a title to write a successful blog. Many bloggers start with an idea or a topic. They write the article and once it’s done they figure out a title that will capture attention. Here is what I think is a good strategy for blog titles. Start with titles that work well for other bloggers and publications. You might as well because these are proven formulas to get people interested in your content. If you don’t have that you’re going to really struggle to get readers regardless of how good your content is. Then experiment with new title formulas. When they work add them to your regular schedule. When they don’t work toss them out and try new ones.